On the 8 December 1941 the Japanese Empire went to war against the British, Americans and Dutch. The bigger railway ships took on a wartime grey livery and small A.A. guns were mounted on their decks. In 1942 and 1943 another two large passenger ships joined the Kampu N.R. fleet. These were the Konan Maru and Tenzan Maru (Fig. 8). At almost 8,000 tons they were the largest of the railway ships. Their passenger capacity was 60 in first class, 342 in second class and 1,646 in third class, a total of 2,048 people, plus 184 crew. No doubt the needs of wartime saw these figures often exceeded. Twin screws, powered by turbines, drove them at over 23 knots. As well as the plan to increase the capacity of the Seikan N.R. by providing more train ferries for this route, at the other end of Honshu work was in progress on boring the Kammon Undersea Rail Tunnel, between Honshu and Kyushu. This tunnel was opened for use in late 1942, and in consequence the Kanshin N.R. ceased operation at the same time, three of the side-wheel train ferries from this route, Nos. 3, 4 and 5 Kammon Maru being transfered to the Uko N.R. Whilst the new tunnel took care of the through rail traffic between the two islands there was still a requirement for a local passenger service across the Kammon Strait, and the Kammon N.R. continued to operate throughout the war using the Choshui Maru, Hosan Maru and Shimonoseki Maru (II) (Fig. 6). To take some of the load off Shimonoseki harbour, a second N.R. across to Pusan was opened up in July of 1943 from Hakata in Kyushu, this being called the Hakpu Navigation Route. Two ships of the Kampu N.R., Shokei Maru and Tokuju Maru were initially allocated to this service, the Tokuju Maru being replaced by the Keifuku Maru in October of 1944. During the first years of the Pacific War the Japanese forces held the Allies off at great distances away from the Japanese home islands, and Japan's coastal and short-sea shipping, which included the railway ships were able to go about their business without much fear of attack. The U.S.N. submarine force, which at that time was the only Allied force capable of consistently reaching the waters around Japan itself was pursuing a policy of attacking Japanese warships and largely ignoring merchant shipping. But, in September of 1943, U.S.N. Lt. Commander D. Morton took his submarine, the U.S.S Wahoo, north around Hokkaido and into the Sea of Japan, with the intention of attacking the shipping traffic between Korea and Japan. On 5 October 1943 the Wahoo intercepted the Konran Maru on its regular Kampu N.R. run and sank her by torpedo attack, the loss of life being 542 persons. The Konran Maru had begun operating in April of 1943, and so was lost after only six months in service, this was the first war loss of a railway ship. The Wahoo sank a number of other ships in the Sea of Japan during this cruise, but was itself lost while attempting to return to its base. P> The year of 1944 saw no further railway ship losses, but 1945, with the U.S. forces now closing in on Japan itself was a year of disasters. The newest train ferry, No. 9 Seikan Maru, launched from the Uraga Dockyard, south of Yokohama, had completed its fitting out by late February of 1945 and set sail on its voyage up the coast en-route to the Seikan N.R. On the 27 February this ship was off Katsura, on the coast of Chiba Prefecture where she was caught by U.S.N aircraft and there sunk, before even entering revenue service. No. 5 Seikan Maru was lost on the 6 March, not by enemy action, but by colliding with a breakwater in Aomori harbour, where she sank. Japan's coastal shipping was by now not only facing attacks by U.S.N aircraft and submarines, but mines were also taking a toll. In 1945 the U.S. Navy had embarked on an extensive programme of mining from the air Japan's coastal waters, particularly those waters around major harbours. The Kampu N.R. was particularly affected by this programme, between 1 April and on into June and July, five Japanese railway ships struck mines in the seas around Shimonoseki. One of these ships, Shiragi Maru, was a total loss, of the four others, Koan Maru, Iki Maru (II) and the veteran Shimonoseki Maru (II) were all damaged and towed back to harbour to undergo repair, while the Kongo Maru was sunk, but later refloated and brought back into service after the war's end. In the light of these losses, along with other sinkings from mines in the same area, on the 20 June 1945 the Ministry of Transport decided to suspend regular shipping operations to Korea, and from thence forward the ships from the Kampu and Hakpu N.R.s operated an irregular service from small harbours on the Japan Sea coast. However, these losses, although serious, were minor compared with those inflicted on the Seikan N.R. on the 14 and 15 July 1945. On the 14 July a large fleet of U.S.N carrier borne aircraft carried out a series of air strikes on the ships of the Seikan N.R. By the end of that day, nine train ferries had either been sunk or driven ashore in a badly damaged condition. The ships lost were Nos. 2, 3, 4, 6 and 10 Seikan Maru, Hiyan Maru, Matsumae Maru, Shoho Maru and Tsugaru Maru. Four of these ships were sunk in Aomori Harbour, two at Hakodate and three at sea, and to add insult to injury the U.S.N aircraft returned on the 15 July and found No. 1 Seikan Maru which had taken shelter in Mimaya Bay, to the west of Aomori, and sank her there. Only two train feries, Nos. 7 and 8 Seikan Maru survived these attacks. So, by mid-July of 1945 the Kampu and Hakpu N.R.s had ceased regular operation because of the danger of mines along their routes and the Seikan N.R. fleet had been almost completely wiped out by air attack. It is possible that the losses on these two N.Rs., more particularly those on the Seikan N.R., would have had a considerable effect on the Japanese war effort, but with the actual end of the war only a month in the future, any such effect is difficult to evaluate. Further losses of railway ships before the war's end saw Tenzan Maru, the pride of the fleet, sunk in the Japan Sea by air attack on the 28 July, most of its complement being saved, and on the 10 August the Aniwa Maru, which had been transfered to the Seikan N.R. from the Chihaku N.R. to try to make up for the losses of 14 and 15 July, was sunk by aircraft near Aomori. Finally, on the 13 August, the day that the Pacific War ended, the Tsushima Maru was scuttled. The last wartime action of a Japanese railway ship was that of the Soya Maru, on the Chihaku N.R. The atomic bombs were dropped on Japan on the 6 and 9 August. On the 8 August the U.S.S.R. declared war on Japan, and commenced the invasion of Manchukuo and Karafuto. On the 13 August the Soya Maru began evacuating Japanese troops and civilians from Karafuto across to Hokkaido, this evacuation ended on 24 August, by which date the Soviet forces had completely occupied South Karafuto, and on this day the Chihaku N.R. ceased to exist. At the beginning of the Pacific War there were 36 major vessels in the Japanese railway ship fleet, by the end of the war only 24 remained. With the coming of peace, the rebuilding of the Japanese transport system began. Some of the surviving railway ships whose routes no longer existed were then used on duties such as the repatriation of Japanese troops from overseas and for other tasks under the control of the U.S. military forces. In late 1945 and early 1946 three new train ferries, No. 11 Seikan Maru, No. 12 Seikan Maru and Ishikari Maru (Fig. 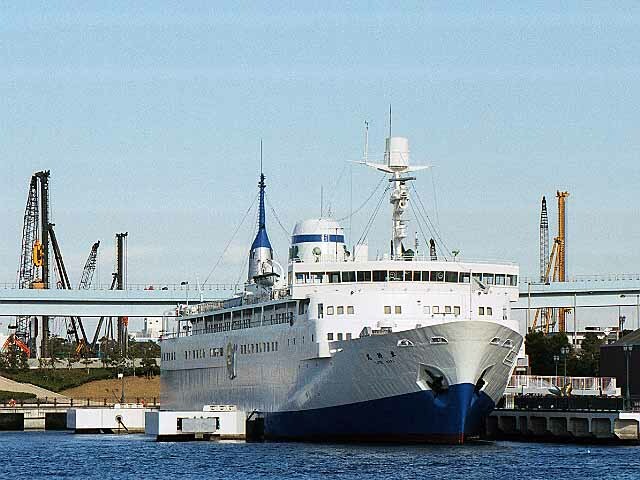 9), this last vessel being an improved version of the Seikan Maru class with accomodation for 394 third class passengers, entered service on the Seikan N.R., bringing welcome relief to that hard-pressed route. In May of 1946 a second N.R. between Honshu and Shikoku came into service, this was the Nihori N.R., running between Nigata in Honshu and Horie in Shikoku. The first vessel on this route was the passenger ferry Choshui Maru, 410 tons, 10 kts., with a passenger capacity of 749 people. This ship had previously been used on the Kammon N.R. In this year too, the Oshima N.R. which had been operated by the Yamaguchi Prefecture was taken over by the Government and run as a railway Navigation Route, the ships used here being the Yamaguchi Maru and No. 2 Yamaguchi Maru. 1946 also saw the commencement of a building programme to replace the railway ships lost during the war, and in the years 1947 to 1949 ten new vessels joined the railway fleet. Three of these ships were for the Uko N.R., Bisan Maru, Shiun Maru and Washiu Maru. All were of 1,450 tons, turbine driven at a speed of about 14 1/2 knots, and all were of a design that could carry both passengers and railway vehicles. The closed vehicle deck had two lines of railway tracks, sufficent to accomodate 14 wa mu class waggons, and 20 first class, 167 second class and 1,313 third class passengers could be carried as well. The other seven new vessels all came into service on the Seikan N.R. These ships were of two types, four being straight-out train ferries of about 3,000 tons and 17-18 knot speeds and carrying 44 or 42 wa mu waggons on four tracks, named Hidaka Maru, Kitami Maru, Oshima Maru and Tokachi Maru. The other three vessels were passenger and train ferries, similar to those built for the Uko N.R., but at 4,000 tons, considerably larger, although their wa mu waggon capacity of 18 was only slightly greater, and their passenger loading of 932, comprising 44 in first class, 255 in second class and 633 in third class was smaller. These ships were the Mashu Maru, Toya Maru and Yotei Maru, all 17-18 knotters. On the Kammon N.R., whilst the opening of the Kammon Undersea Railway tunnel in 1942 had seen the finish of train ferries on this route, passenger ferries had continued to run, and in 1947 the carriage of motor vehicles on this N.R. began, using Shimonoseki Maru (II). Mid 1949 saw the formation of Japanese National Railways, and the railway ships came under the control of this organisation, which, amongst many other changes, brought about an alteration in the funnel colours and markings, as shown in Fig. no. 12(b). By 1950, the rejuvenation of the railway ship fleet was well under way, with 26 ships in service, including 14 on the Seikan route. The year 1953 saw the beginning of a major change in propulsive power, from the steam turbine to the diesel engine. No. 3 Uko Maru, a 22 waggon capacity train ferry of 1,282 tons, entering service on the Uko N.R. in May of that year was powered by two diesel engines with a total horsepower of 2,204, and all railway ships built after this date had diesel engines. Another technological innovation of that period was the use in 1954 on the newly launched Miyajima Maru of the unusual Voith-Schneider vertical propellor, which could be remotely controlled to vary the speed of the vessel and also to give forward or astern motion independent of the diesel engine speed. But, 1954 was also another year of disaster for the Seikan N.R. On the 26th of September a very severe typhoon, numbered 15 by the Japanese authorities, and named 'Marie' by the West, struck northern Honshu and the southern part of Hokkaido. Hakodate suffered severely with much damage and many deaths occuring on land, and at sea five Seikan N.R. ferries were sunk, along with three other ships and about 200 small craft. The five ferries lost were Hidaka Maru, Kitami Maru, No. 11 Seikan Maru, Tokachi Maru and Toya Maru. The most tragic of these losses was that of the Toya Maru which, with an almost full load of passengers and railway vehicles, had just left Hakodate harbour enroute for Aomori when the typhoon struck. The increasingly bad weather forced the Toya Maru to return to Hakodate harbour, where she anchored, but her anchors dragged and she was blown out of the harbour and onto rocks. There she took on a severe list, the railway vehicles broke away from their fastenings, and she capsized and sank. More than 1,000 people, passengers and crew, died in this disaster, which in contemporary Japanese reports, was compared with that of the Titanic. None of the other ferries sunk were carrying passengers, but even so over 300 of their crews perished, altogether about 3,000 people died on land and at sea on this day. As a stop-gap measure to make up for these losses, in early 1955 an ex-Kampu N.R. ship, the old Tokuju Maru, a 3,600 ton 20 knot passenger vessel dating from 1924 was put into service on the Seikan route, where it operated for another three years or so. Of the ferries sunk in this disaster, Hidaka Maru and Tokachi Maru were both refloated in 1956 and returned to service on the Seikan N.R. 1955 was also a bad year for Japan's railway ships, on the 11 May of that year, the 1,450 ton train ferry Shiun Maru, on the Uko N.R., collided in dense fog with No. 3 Uko Maru and sank in shallow water with the loss of 166 passengers and 2 crew members. Shiun Maru was refloated later in that year and re-named Seto Maru, and under that name continued in service on the Uko N.R. up till early 1966. This collision led to the fitting of radar to all major Japanese railway ships. Mid 1961 saw the arrival on the Uko N.R. of the Sanuki Maru of 1,800 tons, fitted with two Voith-Schneider propellors which gave it a speed of 13 knots. Its three lines of rails could accomodate 24 wa mu waggons and 90 first class and 710 second class passengers could also be carried. The Kammon Undersea Road Tunnel opened for traffic in 1958, this brought about the cessation of the operation of the passenger-vehicular ferries on the Kammon N.R. in 1961, but small passengers only ferries continued to run until 1964, when the Kammon route was finally closed. In the early 1960s, controllable pitch propellors began to be fitted to the bigger railway ships. This device gave the same effects as the Voith-Schneider propellor, mentioned above, but with less complexity. Also, the bow-thruster propellor made its appearance at this time, this being a reversible propellor fitted at the bow of the vessel and facing sideways, and which when operated was capable of moving the vessel's bow to one side or the other. These two devices considerably improved the manouverability of the ferries and so reduced the time taken to dock the vessel and line it up with the railway tracks on the wharf, consequently reducing the overall journey times without any need for an increase in speed. Also, the fitting of closed circuit T.V. cameras at the stern facing aft simplified docking. On the Nihori N.R., the transportation of motor cars began in 1965, using the little side-loading Aki Maru, ex Oshima Maru, this vessel could carry motor vehicles up to a total weight of 5 tons. 1964 to 1967 saw a great replacement of the ships of the Seikan N.R. fleet, with ten new vessels coming into services over this period, largely replacing the group of ships built in the early post-war years. Seven of these new vessels were 8,300 tonners, carrying both passengers and railway vehicles. 48 wa mu class waggons were carried, along with 330 first class passengers and 870 second class passengers. Eight diesel engines drove them at over 21 knots. These ships were: Hakkoda Maru, Mashu Maru (II), Matsumae Maru (II), Taisetsu Maru, Towada Maru (II), Tsugaru Maru (II) (Fig. no. 10) and Yotei Maru (II). The other three vessels, Hidaka Maru (II), Oshima Maru (II) and Tokachi Maru (II) were straight-out train ferries, with a tonnage of 4,100 and carrying 55 wa mu class waggons on four tracks, again at speeds of over 21 knots. New passenger and vehicle ferries also appeared on the Uko N.R. in 1966-67, these were the Awa Maru, Iyo Maru (Fig. 11) and Tosa Maru, which at 3,000 tons were smaller than their Seikan contemporaries. They carried 27 wa mu waggons, but their shorter journeys allowed them to have a large passenger capacity, with 300 in first class and 1,500 in second class. They had a speed of 16 knots. Also, the 1960s saw changes in the external appearance of JNR's railway ships. From 1907 the railway ships had black hulls, white upper works and buff funnels with black tops and the red Kanji marking of the Ministry of Engineering. Now these ships became quite colourful, their hull colours including green, light green, grey blue, deep blue, yellow, orange, red, deep red, and even black. White was still the main colour for the upper works, and the funnel markings now were the new JNR logo and funnel bands in the hull colours (Fig. no. 12(b)). For the passengers, air-conditioning, television, reclining seats, vending machines and other comforts made their appearance on these new vessels, and in 1967 the Seikan N.R. began to carry motor vehicles on their ferries as well as railway vehicles. With the continuing growth of the Japanese economy it had become obvious that even with the fast speeds and quick turn-around capabilities of the modern ferries on the Seikan and Uko N.Rs, these routes were approaching their maximum capacities, so decisions were made to begin planning for a railway tunnel under the Tsugaru Strait between Honshu and Hokkaido, and a bridge, actually a series of bridges, from Honshu to Shikoku. Whilst the planning and design of these huge projects went ahead, the mid 1970s saw the construction of the last group of major vessels for the JNR railway ship fleet. For the Seikan N.R. three ships were built, Hiyama Maru (II), Ishikari Maru (II) and Sorachi Maru (II), all 4,000 ton, 55 waggon capacity, 21 1/2 knotters, while the Uko N.R. received the 3,000 ton Sanuki Maru (II), 16 1/2 knots, with a capacity of 27 waggons and 2,350 passengers, of which 334 were in 'Green' class and 2,016 in 'Ordinary' class. The change of passenger accomodation classification from 1st., 2nd. and 3rd. to 'Green' and 'Ordinary' classes came about with the introduction of the Sanuki Maru (II) into service, the earlier vessels being altered suitably as they came in for overhaul. An interesting experimental vessel appeared in 1971, this was the Kamome (note: not Kamome Maru), a small, high-speed air-cushion craft, capable of carrying 52 passengers and driven by two aircraft propellors at a speed of 55 knots. This vessel was used on the Uko N.R. and made the 20.7 km journey in a time of 23 minutes, as compared to the 1 hour taken by the conventional ferry, but this design was taken no further. The construction in 1976 of the Grand Oshima Bridge between Honshu and Yashirojima saw the closure of the Oshima N.R., and changes in the traffic pattern between Honshu and Shikoku saw the finish of the Nihori N.R. in 1982. A small, colourful, addition was made to the livery of the Seikan N.R. ships in the 1980s with the adoption by each ship of an individual badge, which was carried amidships on each side of the hull. These badges were circular, with a peripheral ring or garter on which the ship's name appeared in Roman letters, on the lower part of this ring was superimposed a drawing of a dolphin, and within the ring there appeared a stylised representation of the locality after which the ship was named. Fig. no. 13 shows a sketch of Mashu Maru (II)'s badge. On 1 April 1987, J.N.R. ceased to exist and was replaced by the Japan Railways (JR) group of companies, the remaining N.R.s still operating being split up amongst the groups, the Seikan N.R. going to JR Hokkaido, the Uko N.R. to JR Shikoku and the Miyajima N.R. to JR West Japan. Fig. 12(c) shows the change in ship's funnel markings, with the JR logo being in the appropriate group colour. However, the Seikan and Uko N.R.s only had about another year of operation ahead of them after this change, as in March of 1988 both the Seikan Undersea Tunnel, directly connecting the railways of Hokkaido and Honshu, and the Grand Seto Bridges, doing the same for Shikoku and Honshu were opened for traffic, thus ending 80 years of railway ship operation on the Seikan N.R., and 78 years on the Uko N.R. The Seikan N.R. 's last operated Yotei Maru berthed at the Maritime Museum in Tokyo. This vessel was built in 1964 and in service until the last operation day of the Seikan N.R. She now serves as a floating museum showing the feature of a railway ship around the 70s. Taken by Hiroshi Naito, March 2000. With their services no longer needed most of the major ferries were disposed of, however the Sanuki Maru (II) of the Uko N.R. was retained by JR Shikoku and used for sight-seeing cruises on the Inland Sea for a number of years, but this operation ceased at the end of 1996. Of the Seikan N.R. ships, Mashu Maru (II) and the Hakoda Maru both still exist as Museum Ships, the blue-hulled Mashu Maru (II) being berthed in Hakodate Harbour and the yellow-hulled Hakoda Maru at Aomori, both vessels providing excellent exhibits explaining the history of the railway ships. The Modern Transportation Museum at Bentencho in Osaka also has a good, but small, section devoted to railway ships. Although now (1999), it is only possible to see examples of the large railway ships as moored Museum Ships, as mentioned above, it is still possible to travel on a railway ship, and indeed one can use one's JR Rail Pass to do so. JR West's Miyajima N.R. still exists, its small vehicular-passenger ferries shuttling frequently between Miyajima-guchi and Miyajima. This is a very popular run, carrying approximately 2.7 million persons and 60,000 vehicles per year, and in April of 1996 a new ferry, Misen Maru (III), with a capacity of 460 passengers and 15 cars came into service on this route, so with this new vessel the tradition of Japan's railway ships will continue into the next century. Tatsuo Furukawa. Nihon no Tetsudo Renraku Fune. [Japan's Railway Connecting Ships] Tokyo 1976. Hirokazu Inoue. Yamakei Bukkusu - 3, JR no Moto. [Yamakei Books - 3, JR's Roots] Tokyo 1989. Tetsudo Jaanaru No. 20. [Railway Journal No. 20] Tokyo 1988. My thanks go to Hiroshi Usui of Sapporo, tram and railway enthusiast, and also a member of the Japan Domestic Ship Society who obtained for me a copy of Furukawa-san's book, and gave me great help with translation problems that were beyond my limited capabilities in that field. Anthony Robins, JRS member in Nagoya, also assisted with translations. J. R.S. BULLET-IN 14 October 1999.